Many co-workers teamed up on the same project and blew your socks off. Hi5 them! It's super easy and powerful to Hi5 a team! Giving a Hi5 to a group of co-workers only takes 1 of your Hi5's for the week, but gives each team member 1 Hi5! 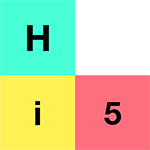 Important: team Hi5's are only available on Desktop and on Android. Click on the Hand icon to start a Hi5. Start your Hi5 by choosing the first team member you'd like to include in your Team Hi5. Add the content of your Hi5, media (like a gif or a photo) and values as normal. Under the More Options heading on the right, click on the Tag co-workers button to choose the other team members to be included in this Hi5. Once you're done and happy with how you've crafted your Hi5, you can click on the Send Hi5 button. Click YES to confirm. You will be able to see the team Hi5 on Hi5 Wall of Fame! Hover over the pink text to see the names of all the team-members who were Hi5'ed.